I want to take better pictures, I want to improve on the way I see things, I want to see my progress. So I have decided to create a blog to post a picture a day. Hopefully by the end of the year I will have accomplished my goals . . . documenting the year with a picture a day and improving my photography skills. I hope you enjoy! I took a walk on the property today. 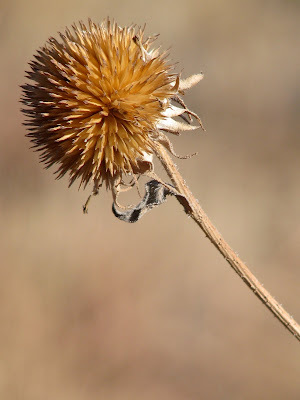 I came across this dead and dried flower. I think this is the most beautiful flower for a cold winter day. Here is the latest picture of Buddy. He is growing fast and is turning out to be a great puppy. He is a Blue Heeler mix and is about 8 weeks old. Well we made it home from our trip to Louisiana for Christmas. This was the view of the Sangre de Cristos from our backyard that greeted us when arrived home. We are on our way home today and we stopped in Pecan Grove Cemetery in McKinney, TX. I liked this statue and the way the sun was hitting it. This is my niece Madison. 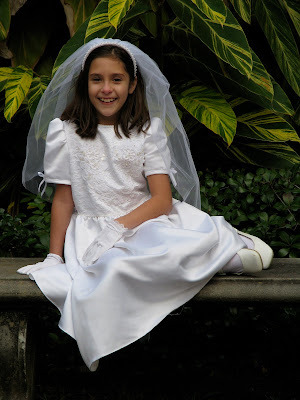 She will be making her First Communion soon. My sister asked me to take pictures of her in her dress since I won't be there on that day. My niece Tori wanted some casual pictures to send out with her graduation annoucements. So today we went out and took quite a few pictures. 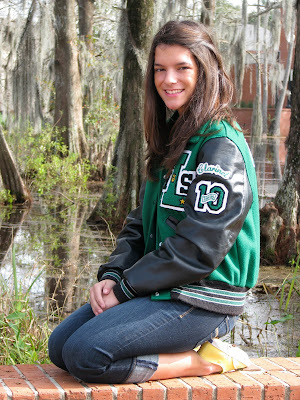 I liked this one with her letterman jacket. She graduates from Lafayette High School in May 2010. I love traveling, I am an avid amateur photographer, I love being outdoors. I frequently go on what I call "Art Walks" - I like outdoor, public art and spend lots of time exploring Santa Fe looking for new pieces.